Every day thousands of semi trucks crisscross the country transporting goods from one from place to another. But although big rigs are a key component of the distribution process, these gas-guzzling vehicles have never been particularly efficient. The average tractor trailer gets less than 7 miles per gallon of gasoline, making it one of the least green vehicles on the road. All told, the nation’s approximately 1.7 million semi trucks burn through more than 26 billion gallons of diesel fuel annually. That number is becoming increasingly unacceptable to truck manufacturers, and not just because they’re concerned with the environmental impact of their vehicles. 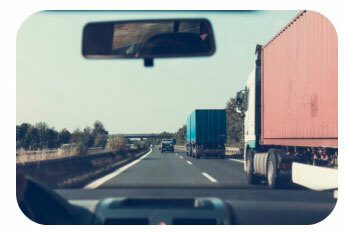 Improving fuel economy by an extra mile per gallon would have the same effect as removing 200,000 trucks from the road. Not only would this be enormously beneficial for the environment, but it would also save trucking companies billions of dollars in fuel costs. That’s why big truck makers like Navistar, Daimler, Volvo and more are all rethinking how to design tractor trailers for maximum efficiency. One potential option is to ditch diesel engines altogether in favor of electric motors. The engine maker Cummins recently introduced the first fully electric big rig this summer, and Tesla plans to unveil a similar prototype in the fall. Still, it could be years before the industry is ready to adopt electric vehicles on a large scale. In the meantime, companies can improve their trucks’ fuel economy by updating exhaust systems or installing fully automatic transmissions. Vehicle design is an important factor as well. Adding “skirts” or “tails” around the base and backs of trucks can improve their aerodynamics, thus reducing the driver’s need to constantly lean on the gas pedal. Still, some truck companies are unwilling to splash cash on these improvements when a new tractor trailer can already cost close to $200,000. But when the long term savings from fuel costs are factored in, it probably makes the most sense to pay for upgrades at the start rather than spend more money further down the road. What are the advantages of making semi trucks more fuel efficient? Why are some truck makers reluctant to spend additional money improving the fuel economy of their vehicles? Source: Erica E. Phillips, “Makers of Fuel-Guzzling Big Rigs Try to Go Green,” The Wall Street Journal, September 21, 2017.